The last few years have seen a proliferation in the number of European showcase festivals, and to the likes of MENT, Spring Break, Vil Vil Vest, Eurosonic, and Tallinn Music Week we can now add Sharpe, a brand new event aimed at providing promising new artists a platform to break borders and gain wider recognition. 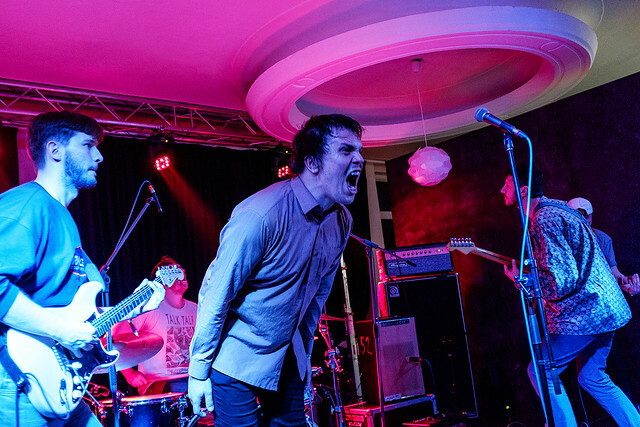 We sent Derek Robertson and Dom Gourlay to Bratislava to dive into the local scene and find out who’s worth discovering. There’s a certain charm to small events - one venue, a couple of nights, and just a few stages meaning you can more or less see everything. I know the people behind Sharpe are quite ambitious, but I really liked the scale of it. It felt very manageable. It also felt like it was designed for the locals as much as the media and industry side, which is refreshing to see - there was a lot of love for some of the hometown bands. A really good, eclectic mix of artists is a deceptively difficult thing to get right, but I thought they nailed it. You’ve been to a fair few events, what did you make of it? I really fell in love with the idea of this kind of showcase at MENT in January. 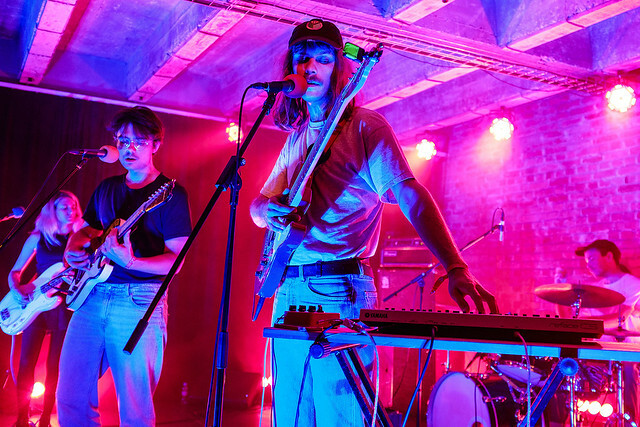 While there's clearly a reason the mainland European music industry wants to showcase their talent, it didn't feel as forced, shaped, or manufactured as many of its more highly regarded counterparts. There's less emphasis on marketability and more on the music. Which is why the majority of acts came from the left-hand side of the road rather than the inoffensive but bland middle ground. What's more, everyone is supportive of each other's acts. There is no obvious competition. And as a result, it makes for a far more enjoyable experience. In Europe, you get the feeling that bookers and festivals are less concerned with notions of “cool” or whatever is currently fashionable than their UK counterparts; it really does come down to the music. Every artist had something, even if they weren’t all to my taste - you could see what they were trying to do. I’ve lost count of the number of buzz bands from Dalston or wherever that I get pitched that seem to have spent more time on styling and photo shoots than writing decent tunes or working out what they want to say, and there’s a lot less of that on the continent. And as you say, “music” seems to be more like a family than a competition, which is how it should be. Blue Crime were a great band to open the festival, and really set the tone. We both saw them at MENT and were impressed - “Sonic Youth crossed with Warpaint” you said - and they were just as great here. 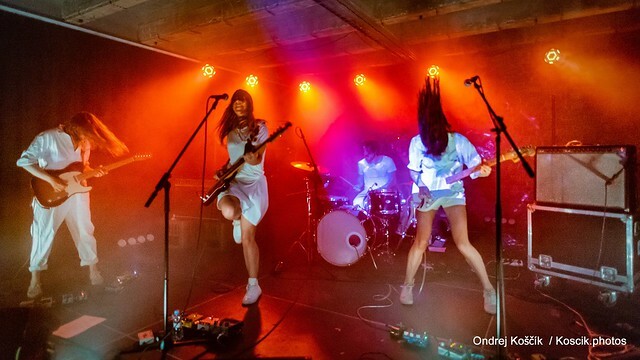 I love how they don’t rely so much on thrash and theatricality; they’re more poised and powerful, and some of their songs are quite hypnotic in an epic, shoegaze-y way. Tracks like ‘Sun Is A Star’ have a wonderful, slow-burn magnificence to them, almost like scorched desert rock, and they come across as a band who worked out very early exactly what they wanted to sound like and have zeroed in on that. The fact they’re followed by Andrea Belfi’s experimental drumming and electro compositions highlights the breadth of music these kinds of festivals support; even if you find his music somewhat baffling, there’s no denying his ambition and technical excellence. It's challenging not just for the audience but also the artists themselves. An uneasy listen that takes guile and finesse to construct and deliver in the first place. It isn't everyone's cup of tea but it's a damn sight more interesting than watching another set of stage school graduates perfect the “Healywave” technique that's been drummed into them by their mentors. A band like Blue Crime should be an easy shoe in to the UK market right now, especially in light of the Keychange initiative, except they don't have the right fit for the style mags or right sound for radio. What they demonstrate is how guitars can be anything but redundant when placed in the right hands, yet sadly very few people back home are likely to be aware of their exceptional talents. Ah yes, “guitar music”. I’ve lost track of whether it’s currently dead or experiencing a renaissance in the eyes of the commentariat, but watching so many exciting bands you quickly realise what a ridiculous notion it is to dismiss an artist purely on the basis of their chosen instrument(s). Take Fentster; poppy post-psychedelia that ventures into funky jams, surf rock, and Tropicalia. Or Papyllon’s soaring post-rock that blends elements of jazz and metal into their widescreen crescendos. And even if you just want to play straight up indie-pop - like Diego - if you’ve got the tunes, the melodies, and the smarts, there’s no reason it can’t be worthy and interesting. Who else impressed you? So many bands ticked all the right boxes for me. 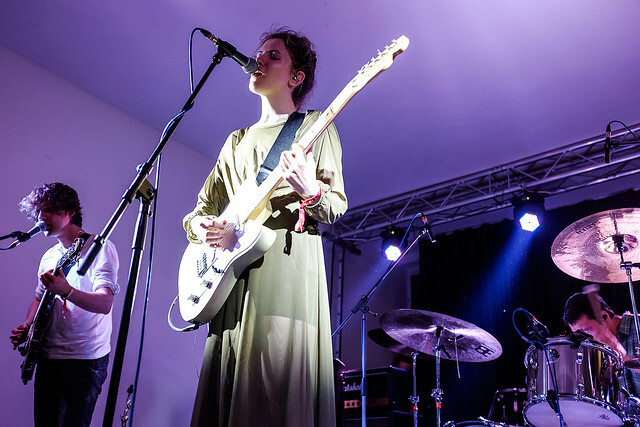 The Ills’ soaring post-rock that was equal bits Explosions In The Sky, Sigur Ros, and Eyre Llew. 52 Hertz Whale and their spacious slacker rock whose frontman reminded me of a young Mark Lanegan. Experimental Danish trio Svin only had 40 minutes but in that time must have touched upon every genre known to man. While Czech shoegazers Manon Meurt upped the ante once more with their elegant mix of reverb fuelled noise that was reminiscent of Slowdive and Beach House respectively. Events like Sharpe are full of hidden gems deserving of a wider audience so it was quite surprising to see that just two UK publications made the effort to venture over. I absolutely adore The Ills; like Mogwai crossed with Explosions In The Sky. It was a bit of a shame they only got to play one track here [on the outdoor stage, they had a number of local bands, each doing just one track], but it was still one of the best things I saw. And 52 Hertz Whale blew everyone else away - it was the most intense, pulsating performance I saw all weekend. They’ve been on my radar a while, and they’re another band who just seem to keep getting better every time I see them. They have that euphoric, post-rock side, and are super melodic, but they also have a captivating power and when they unleash madness, it’s truly spectacular. I also love the story behind their name (which seems like it’s random nonsense) - it’s based on the discovery of “the loneliest whale in the ocean”. They were phenomenal. Reminded me of Mark Lanegan fronting early Verve or Exit Calm. It’s truly astonishing how many of these incredible left field acts exist on their own terms in this part of the world. It’s as if they’ve created their own little counterculture where mainstream acceptance really doesn’t count. In fact, having attended four festivals in Eastern Europe so far this year, it’s difficult to assess what the mainstream is over here? While generic techno does still seem fairly popular, the number of truly innovative, genuinely interesting guitar-based acts is staggering. Bratislava five-piece Tolstoys were another band that stood out. I could hear a wide range of diverse influences in their music that went from Slowdive and Kate Bush to Wild Beasts and the Associates. What was even more astounding was finding out they’ve only been around for the best part of two years and most of them are still in their teens. To be making music this good, this challenging yet polished at the same time at such an early stage in their careers can only reap dividends for the future. I saw Tolstoys last year at MENT and was impressed - very dream-poppy, but quirky with it. They’ve definitely got the chops, I just think they need to be a little bolder and confident; they always sound like they are writing and playing within themselves. But as you point out, they’re not just a young band, they are young full stop - definitely one to watch over the coming years as I think they have a bright future. It’s interesting what you say about the mainstream and Eastern Europe’s approach to more innovative, interesting music. It does seem to be able to exist on its own terms more than similar stuff in the UK. Look at local wunderkind Isama Zing, an experimental producer-come-DJ-come-electro-wizard that everyone was raving about it. His set was phenomenal, and his music is utterly uncompromising - I just can't see anyone suggesting that he has to record with the local equivalent of ASAP Rocky and Charlie XCX or whoever, like what happened with Mura Masa. The very fact he is unique and different is celebrated as a good thing, and the feeling I get is that artists here are allowed more freedom to be who or what they want, and aren’t forced to try and shoehorn their music into some predefined genre or style to make it sellable or more popular. I really hope the industry takes off its rose-tinted, London centric spectacles and takes a voyage of discovery out here. Not just in Slovakia, but also the neighbouring countries around it. Slovenia, Croatia, Estonia, Austria, Belarus and Russia all have an incredibly diverse range of emerging artists about to break right now. It would be a shame if their wares were only confined to Eastern Europe rather than crossing borders into new territories where discerning music fans would welcome such adventurous new sounds with open arms. Even going further afield to places like Hungary and Romania there’s a vibrant underbelly of up and coming acts deserving of a wider audience. Let’s hope common sense prevails in the not too distant future. I’d love to do a blind listening test with a bunch of London music journos, pitting some SoundCloud buzz bands against these European artists. I’m sure the results would be interesting. There’s no reason why some of these bands couldn’t be very successful in Western markets and find a loyal fanbase - they really are that good. We should be thankful that events like Sharpe Festival and the others mentioned above continue to do such a sterling job of giving these artists a more prominent platform, and in bringing Western journalists out to demonstrate just how good their local scenes are. Hopefully, in a year or two, it won’t just be people like us who are paying attention. 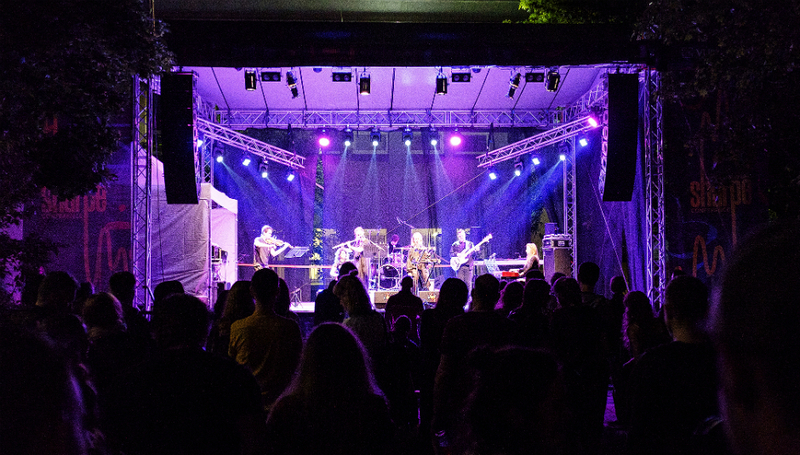 Sharpe Festival takes place in Bratislava. For more information about the festival, including tickets for the 2019 edition, please visit the festival's official website.